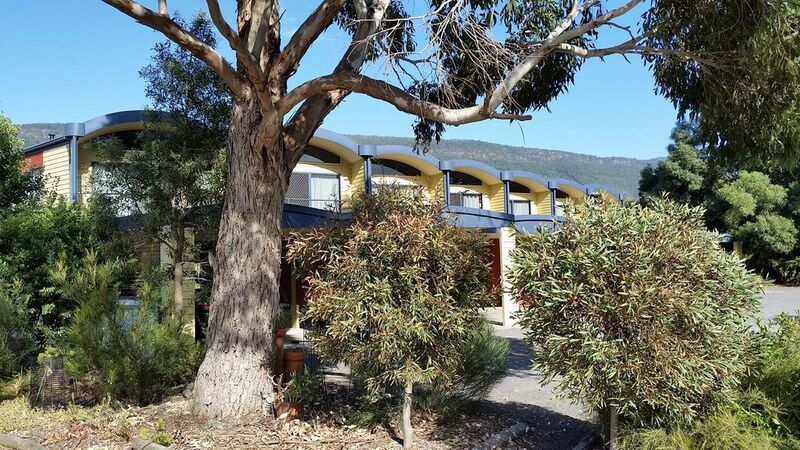 Omringd door majestueuze bergen, en met een adembenemend uitzicht op het Grampians National Park, is Halls Gap Escape de perfecte plek om te ontspannen, te ontspannen en te genieten. Dit onlangs verworven herenhuis met twee verdiepingen beschikt over de nieuwste gemakken die u van hoogwaardige accommodatie mag verwachten: 2 badkamers, meerdere flatscreen-tv's, airconditioning, spa, een open haard op gas, gratis WiFi, twee woonruimtes en een eigen terras met een panoramisch uitzicht op de bergen. De keuken is volledig uitgerust om aan al uw behoeften te voldoen en er is ook een wasmachine en een droger. Als u buiten barbecueert, wijn drinkt en de zon ondergaat, kunt u genieten van de frequente bezoeken van de lokale kangoeroes, emoes en andere dieren in het wild. Halls Gap Escape ligt op 2 km van het centrum van de stad en op slechts 400 meter van het lokale hotel met een zeer indrukwekkend menu en een selectie drankjes. Een fiets / wandelpad brengt je helemaal naar het stadscentrum. Geweldig voor gezinnen met kinderen, koppels of groepen volwassenen. Lakens en handdoeken worden verstrekt. DVD's, kinderspeelgoed, boeken, kinderstoel en porta-wieg ook. Gratis overdekte parkeergelegenheid. Deze accommodatie ligt op een geweldige locatie. Gasten zijn er dol op en jij ook. A perfect spot for myself, husband, mum and two kids. The property was clean and tidy. It was so lovely to watch the kangaroos jumping past only 20 metres away. The perfect place for all ages. The ground floor had everything you need which was great for my mum who struggles with stairs. The property has everything you need! Thanks so much Olivia! I’m glad you had a lovely time, Halls Gap really is a magical place. We were very pleased with the furnishing of the apartment, its cleanliness, its location, spaciousness and well equipped kitchen including the washing machine and dryer. It is one of the best apartments we are blessed with. During the mid afternoon, it was raining and we stayed in watching kangaroos, birds and emu embracing the awesome view of the mountains. Clare was such a wonderful host, so patience and responsive to my constant WhatsApp messages for advice on hikes and food. She had graciously extended our checkout time from 10am to noon. In so doing, we would have a short hike in the morning, took a quick shower before check out. A big thank you to Clare! Thank you so much Sim for your comprehensive review. What a special part of the world Halls Gap is! You are most welcome back anytime! The perfect location and house for a family or group of friends! The house is fitted with everything you need, comfortable and homely. We will definitely be back! Thanks Hannah, you’re most welcome back anytime! Unit 6/15-17 Clematis Drive is a beautiful place with views of the mountains and the wildlife at your doorstep. Claire the host was very friendly and made us feel comfortable. We really enjoyed the fireplace and was really nice and warm, the Kitchen had everything we needed and was very clean and tidy, loved the welcoming beautiful card and wine too. Will definitely come back next year same time. Thanks Caroline, I appreciate your kind words. You and your family were a delight to have stay. Please come back! The house was in immaculate condition with fantastic views of the forest and mountains, with plenty of wildlife around. The house had a very comfy feel with plenty of room for families. Close to the forest entry and local shops. The host was very helpful and quick in response to messages and emails. I will definitely stay there again. Thanks so much Mohomad! I’m so glad that you enjoyed your holiday. You and your friend were absolutely lovely guests, you’re more than welcome to come back anytime!